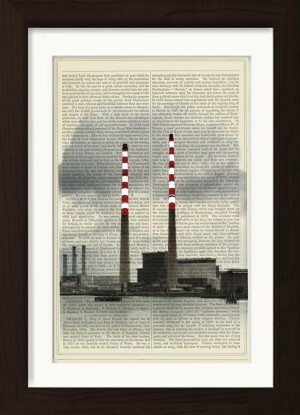 Great news- the ESB have made a decision that means the Poolbeg red and white candy striped chimneys, built in 1969 and 1977 are to stay standing, . The ESB ( Electricity Supply Board ) has decided to keep the Poolbeg chimneys in Dublin and will carry out maintenance work on the famous red and white stacks. Following a review and public backing for the chimneys to remain, it has now been decided to leave them standing in Ringsend. Maintenance works will start this week. This will include placing steel caps on both chimneys, this will protect the chimneys while more extensive works, such as painting and sealing the concrete outer shell, will be evaluated in the coming years. The chimneys, visible from most of Dublin and a well known landmark in the Dublin skyline, distinguished by their height, as Dublin does not have significant high rise development. Some view their 40+year presence on the Dublin skyline as iconic and an essential part of our heritage . They have been described by many as a piece of architectural beauty, holding a special place in their hearts and would be saddened by their loss, others as a blight on the landscape.